When you need more holding power, you need HybriBond Repositionable Mounting Tape powered by Glue Dots. 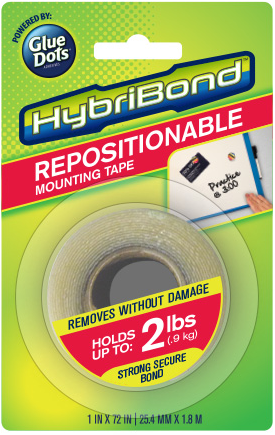 HybriBond Mounting Tape is engineered to bond instantly to virtually any surface holding lightweight items weighing up to 2lbs with a strong, secure bond. Unlike permanent mounting tapes, HybriBond removes cleanly without damage or staining, so you can change your mind or change location without a second thought. HybriBond Mounting Tape differs from traditional mounting tapes because of its adhesive structure. HybriBond is engineered with a very thin support layer placed between two thicker layers of adhesive. This unique construction offers a strong, secure bond for items weighing up to 2 pounds yet removes cleanly without damage.